After posting on the amount of snow that fell here in Mount Shasta, I can’t resist putting up some images of what the mountains around here look like after the big storm. Tuesday proved to be a gorgeous bluebird day and it was impossible not to rejoice at seeing so much snow smothering pretty much everything. The depth varied as you headed north or south from my house (which sits up on a pass) but no matter where you went it was a substantial amount. I can only imagine all the skiers at the ski park or climbing various mountains and cutting up some backcountry powder. I am eager to get some snowshoes on and head out into the woods! Enough of my thoughts though, I want to put up some pictures to show how spectacular the conditions are right now! 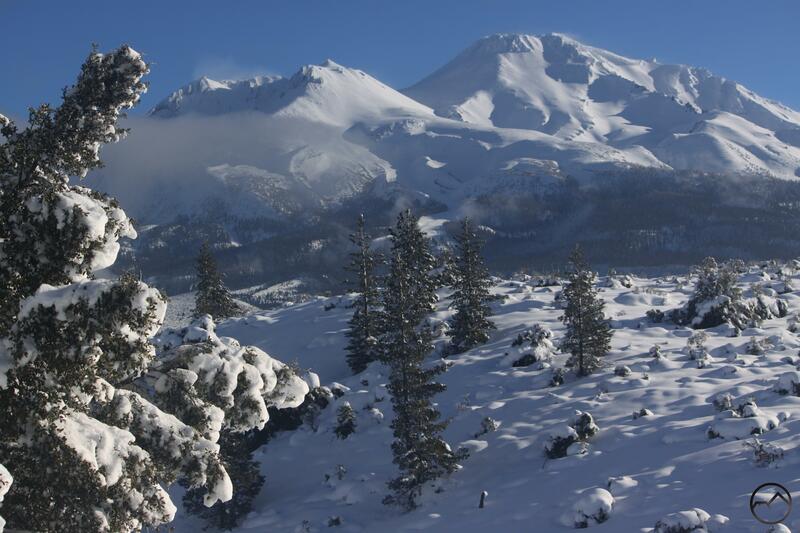 Mount Shasta presides over the snow landscape. Another view of Mount Eddy. Black Butte looking not so black. Harsh conditions evident on the summit of Black Butte. Rime ice on the flank of Black Butte. Ski trails on the slope of Black Butte. Back on the home front, I had an unusual experience. The road I live on has had so much snow piled up on it that it had pretty much narrowed down from two lanes to one. The wide margins were gone and much of the pavement was swallowed up by towering ice berms. Though two cars could carefully pass, that was becoming a precarious proposition. Today, however, the county pulled out its giant rotary snowplow. 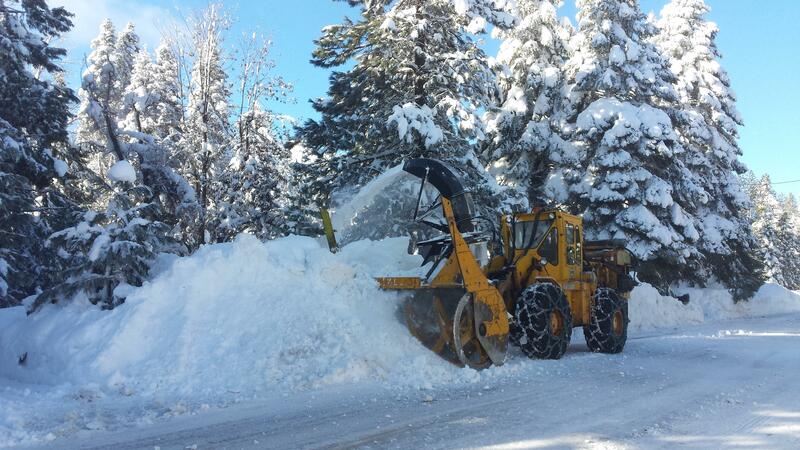 This incredibly powerful machine is essentially a giant snow blower. It inched its way down both sides of the street and effortlessly ate away at 6 feet of ice on either side of the road. The sheer icy walls on either side of the pavement were 10-12 feet high! It was an inspiring sight! As things settle down and get back to normal, the forecast already shows signs of more snow on the horizon. My kids continue to love playing in the snow. 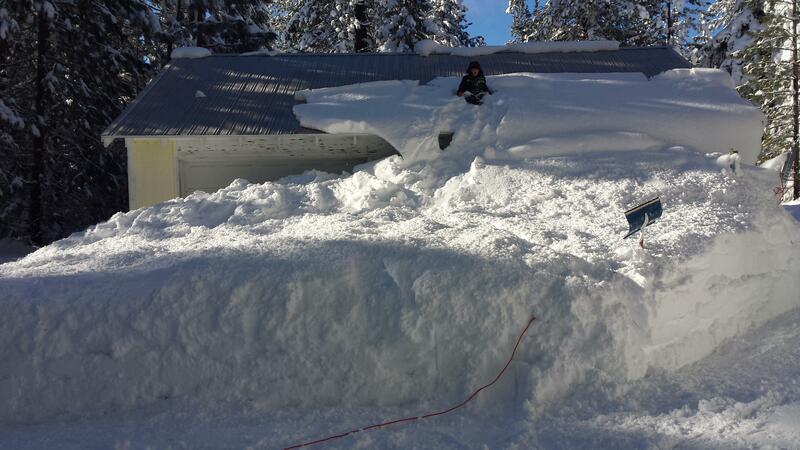 In particular, my 7 year old son has taken to using small, claw-shaped shovels to do some basic ice-climbing onto the roof of the garage. I am impressed with just how much this kid loves the snow. He seems to be a natural. Although he has been through storms in the past, since there has been a prolonged drought, this is the first big one he has lived through and he (as well as his younger siblings) have handled it with aplomb. The drought is essentially over, thankfully. Check out the satellite images of the state from 2014 and 2017 here to get an idea how the conditions have changed. Those images are not including this latest, massive storm! OK, more hiking posts coming soon. Until then, stay blessed!